I’ll happily admit it, I probably didn’t to get to play dressup with dolls enough as a small boy growing up. Thankfully my dachshunds today allow me to satisfy that need as an adult. My pack has a very extensive wardrobe, as many of you already know, and we particularly like Halloween. We have a lot of costumes on hand. I can’t help it. I simply can’t decide on one so I end up getting them all. I find it so amusing to see them dressed up as different little characters. It makes me laugh and they’re always a great sport about it, probably because they’re always handsomely compensated with treats. Even so, I don’t think my style hounds are bothered much by it. In fact, I know they’re not. Often times when I pull out the clothes, they all seem to fight over who will be the lucky pup. This time, Emily won. 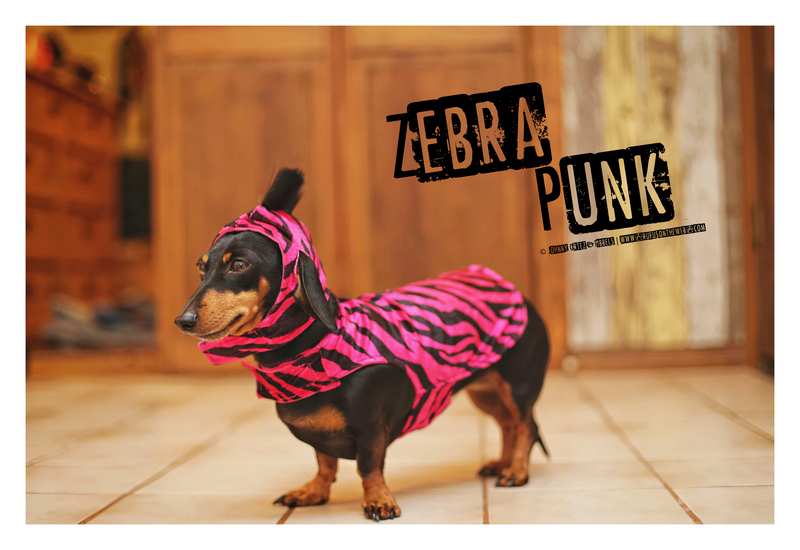 I just thought this pink zebra outfit would be a good complement against her natural black coat. Once I put it on, I immediately thought: Zebra Punk! What do you think friends!? Do you dress yours for the Halloween holiday!??! Sound off below in the comments and enjoy the pictures. More will surely follow in the days leading up to All Hallows’ Eve. This entry was posted in Emily and tagged #ADachshundsLife #HappyHounds, #AdventuresWithDachshunds, #black and tan dachshund, #dachshund, #DachshundPhotography #DachshundArt #OriginalPhotography, #Halloween #Halloweenie, #smooth dachshund, #Target, #WienerDogs #HotDogs, doxies. Bookmark the permalink. 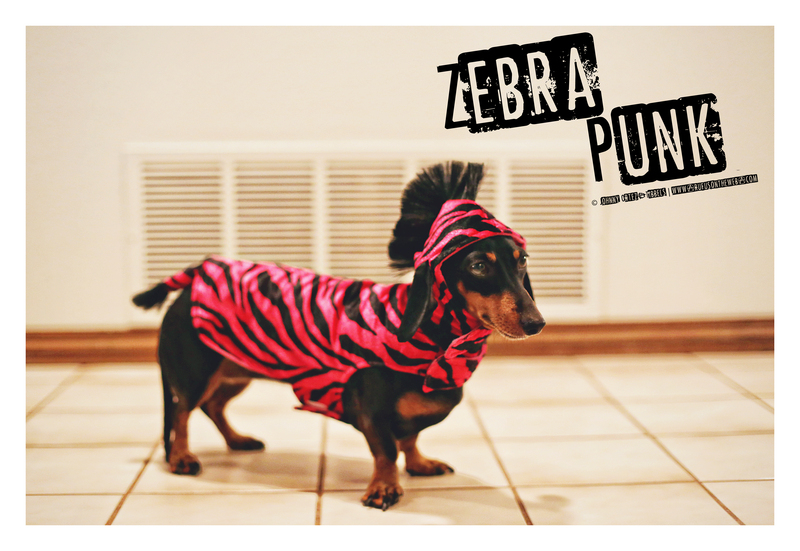 5 Responses to Zebra Punk! If I put so much as a collar on Tootsie Roll, she freezes in place and will not move. I bought her a gorgeous collar years ago from a lady who makes them for Greyhounds. I matched the beautiful colors with her chocolate coat. All for nothing. I can get a sweater or coat on some. That’s about it. You have to start when they are young and do it consistently. Mine all prefer to be naked. Emily looks adorable. I hated dolls when I was a kid. Took all their clothes off and dragged them around by the legs. Too much of a tomboy for dolls. I have 2 females that freezes no matter what I put on them! The momma loves to be dressed. But I have to watch the boys because they pull her around the house like she is a rag doll….lol…she is 5lbs & they are all over 12lbs!